I drove along Lakeshore Drive in Chicago, knowing that a good place to watch the Winter Solstice sunrise over Lake Michigan was just ahead. I was in graduate school, and this spiritual practice of watching our Sun rise on the Winter Solstice was still quite new – I had unknowingly entered my gateway into Paganism (from bare Atheism) just a few years before, and it still felt a little forced, though less so every year. Back then, in 1996, there was nothing else to my entire spiritual practice – all the other Sabbats, my daily dedication, gratiTuesdays, the spiritual pilgrimmage to Stonehenge, and more, would only be added later, in small steps. This simple act of watching the sunrise on the Winter Solstice, of reveling in the returning light, of remembering my countless human Ancestors who watched the Winter Solstice sunrise with hope & joy (and, sometimes, real relief), of being thankful for this past year of life – was already enriching my life. I had no way of knowing that I would remember the next moment for my entire life. It was then that the NPR announcer reported that Carl Sagan had died. I realized that this day was indeed the darkest day, a Winter Solstice for humanity in more ways than just our axial tilt. That was 20 years ago. It seems like yesterday. Now that it’s early January, this remembrance won’t overshadow our Solstice celebrations – but is still near enough to feel its power. If Dr. Sagan were able to talk to us for this column, I think he’d likely start off by reminding us that he was suspicious of the concept of heroes – because the idea of heroes suggests that some people are better than others, that these “heroes” go off and do heroic things that are beyond the capabilities of us mere mortals. No. Instead, Dr. Sagan encouraged us, everyone, to do what we can do, and to never look to the accomplishments of someone else as a reason not to do something yourself. Very true. I hope to do as much as I can to build a better world for future generations. Toward that end, I can’t help but notice the huge impact that Carl Sagan’s life has had – not just by inspiring me, but also by inspiring literally millions in my generation. Oh, but wait …. I hear others today – people not even born when Cosmos aired in 1980 – people who were only young children in 1996 – also speaking and acting due to the power of Carl Sagan’s works. Then I see my own kids watching Cosmos, and Neil DeGrasse-Tyson’s excellent echo of Cosmos. It’s clear that the massive benefit is only just begun to be seen. Hero? OK, I won’t call him that. I’ll just be honored, encouraged, and empowered to help. Carl Sagan has left us so much to draw from that it’s hard to know where to start. Many parts of it – such as episode 13 of his Cosmos series – bring me to tears, again and again. Tears of joy, tears of awe, tears of hope, tears of caring for our grandkids. I’m so glad that Neil DeGrasse-Tyson’s last episode of his Cosmos series captured much of that same magic. Below, I’ve listed a few others that I’ve found transforming. I could write more about the incredible view of our Universe, of ourselves, that Carl Sagan has given us – but of course that doesn’t compare to directly experiencing them yourself. If you haven’t seen the Cosmos series, this anniversary might motivate you do so. If you haven’t seen the new version, then this applies to that as well. So much of what Carl Sagan said about critical thinking applies to today’s world – perhaps more than we’d like. As children, most of us wondered, questioned, and thirsted after knowledge. Carl Sagan was able to keep that childlike wonder through adulthood, bringing that joy to countless millions. His short description of finding Greta Garbo when he was looking for the Universe, of his realization that the stars must be farther away (maybe?) than even New Jersey shows how that window of awe opened for him – that same window of awe that each of us, as Naturalistic Pagans, found – either with his help or on our own. He not only kept that spark alive, but made it his life’s mission to bring it, and science, to everyone – a drive that brought scorn from scientific elites and hurt his career. It’s truly amazing that he was so successful – well, at least until one hears his voice. In addition to the resources below, his last public speech is powerfully moving, and speaks especially to naturalists such as us. It’s available at the bottom of the link here. You can skip right to his speech (which starts at 50:00) – and find out what I meant with that Greta Garbo reference above. The last 15 minutes (from ~84:00 to 100:00) are a stunning wake up call for naturalists such as us, and our interactions with other people. While he talks a lot about non-religious pseudoscience, much of it applies to supernatural religions too (especially his discussion of death). 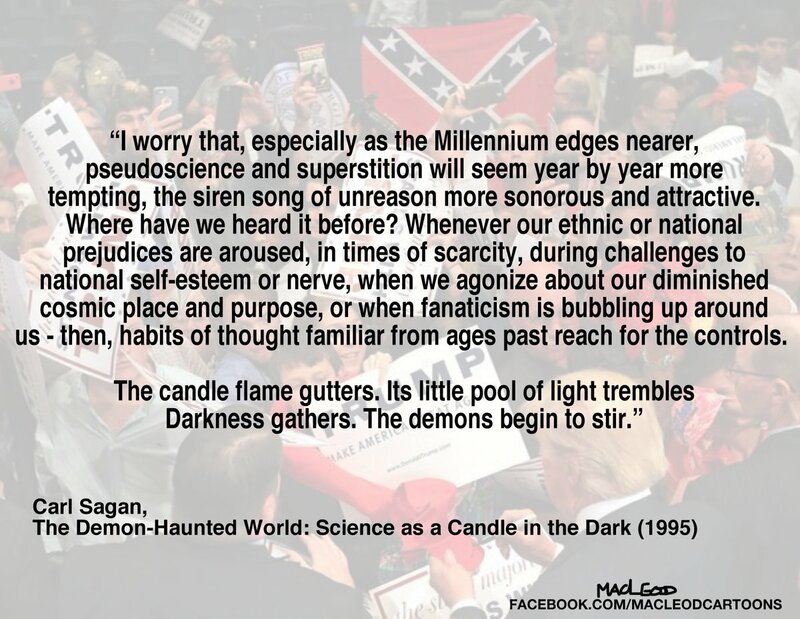 The vast majority of harmful supernatural belief in America is part of Christianity – yet his career rarely opposed that explicitly, instead focusing on other supernatural pseudosciences like alien abduction, psychics, etc. (and on critical thinking in general). I think that he did this because he had to. Back then, coming out in any way against Christian supernatural belief would have meant that none of us would even have heard his name. Readers born after about 1980 might not realize this. I remember the 80’s, 90’s, and before. Any significant voice pointing out the harm or superstition of Christianity in America was immediately met with strong attacks that usually silenced that voice to the public forever. Something as minor as including a picture of Jesus in the faces on the cover of the Sgt. Pepper album was not allowed. I think Carl was very aware of that line, and carefully managed it, for us. If you watch, you’ll see subtle references against religious supernatural belief in his work – even in Cosmos*. I’m amazed at how far we’ve come. It sill exists today, with uproar by fundamentalist Christians against the Cosmos sequel. This last 15 minutes of his speech, I think, speaks directly to us naturalists, and is very important to how we approach supernatural religion today. And of course, like any other religion, there healthy versions of Christianity that are consistent with reality. The rest of the podcast is good as well (you can download it at the same link. I listen to it on my commute from time to time). Thank you, Dr. Sagan – for giving the eyes of the Universe to so many of us. * One possible example – Episode #3 is about the pseudoscience of astrology. After debunking it, the camera pans over a large church at 6:50, as Sagan says “The desire to be connected to the cosmos reflects a profound reality. We are connected – not in the trivial ways the pseudoscience (of astrology) offers, but in the deepest ways….” and then describes how we are actually connected, based on what we now know is real. Thank you, Jon. Made my morning!